In 2007, the Detroit Lion defense began the first half of the season with 13 interceptions, the most in the NFL. The next best teams had 11. It's reasonable to expect that the Lions would tend to continue to generate high numbers of interceptions through the rest of the season, notwithstanding calamitous injuries. I wouldn't expect them to necessarily continue to be #1 in the league, but I'd expect them to be near the top. And I'd be wrong. It turns out they only had 4 interceptions in their final 8 games, ranking dead last. So halfway through the season, if I were trying to estimate how good the Lions are in terms of how likely they are to win future games, I might be better off ignoring defensive interceptions. Although turnovers are critical in explaining the outcomes of NFL games, defensive interceptions are nearly all noise and no signal. Over the past two years, defensive interceptions from the first half to the second half of a season correlate at only 0.08. In comparison, offensive interceptions correlate at 0.27. As important as interceptions are in winning, a prediction model should actually ignore a team's past record of defensive interceptions. You might say that if defensive interception stats are adjusted for opponents' interceptions thrown, then the correlation would be slightly higher. I'd agree--but that's the point. Interceptions have everything to do with who is throwing, and almost nothing to do with the defense. This may be important for a couple reasons. First, our estimations of how good a defense is should no longer rest on how many interceptions they generate. Second, interception stats are probably overvalued when rating pass defenders, both free-agents and draft prospects. I've made this point about interceptions before when I looked at intra-season auto-correlations of various team stats. That's a fancy way of saying how consistent is a stat with itself during the course of a season. The more consistent a stat is, the more likely it is due to a repeatable skill or ability. The less consistent it is, the more likely the stat is due to unique circumstances or merely random luck. The table below lists various team stats and their self-correlation, i.e. how well they correlate between the first half and second half of a season. The higher the correlation, the more consistent the stat and the more it is a repeatable skill useful for predicting future performance. The lower the correlation, the more it is due to randomness. In a related post, I made the case that although 3rd down percentage tended to be consistent during a season (0.43 auto-correlation), other stats such as offensive pass efficiency and sack rate were even more predictive of 3rd down percentage. In other words, first-half-season pass efficiency predicted second-half-season 3rd down percentage better than first-half-season 3rd down percentage itself. But what about other stats? Are there other examples where another stat is more predictive of of something than that something itself? Below is a table of various team stats from the second half of a season and how well they are predicted by other stats from the first half of a season. For example, take offensive interception rates (O Int). Offensive sack rates (O Sack) from the first 8 games of a season actually predict offensive interception rates from the following 8 games slightly better than offensive interception rates (0.28 vs. 0.27). There are a thousand observations from this table. I still see new and interesting implications whenever I look it over. Having a potent running game does not prevent sacks. The pass rush predicts defensive pass efficiency as well as defensive pass efficiency itself. 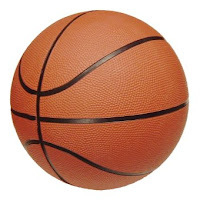 Running does not "set up" the pass, and passing does not "set up" the run. They are likely independent abilities. Offensive sack rates are much better predicted by offensive passing ability than previous sack rates. Defensive sack rate predicts defensive passing efficiency, but defensive passing efficiency does not predict sack rate. We see that many stats, such as passing and running efficiency predict themselves fairly well. But even those stats might be better predicted by using a combination of themselves and related stats. For example, in my previous post I noted how accurately offensive 3rd down percentage could be predicted using passing efficiency, sack rate, and interception rate. The implications of these auto-correlations are numerous. Team "power" rankings and game predictions (both straight-up and against the spread) rely on a very simple premise--past performance predicts future performance. We now know that's not necessarily true for some aspects of football. Lions head coach Rod Marinelli might be banging his head against the wall trying to understand how his defense was able to grab 13 interceptions through game 8, but only 4 more for the rest of the season. He's wasting his time. The answer is that in the first half of the season, the Lions played against QBs Josh McCown (2 Ints), Tavaris Jackson (4 Ints), and Brian Griese twice (4, 3 Ints). Bill James takes a look at when leads become insurmountable in college basketball. In other words, when should CBS cut away from the UNC-Mt. Saint Mary's game to show us the barn-burner between Vanderbilt and Siena? Pretty cool. This is the kind of thing James is really good at. Unfortunately, I think he buys into a logical fallacy later in his article. He says that if a team is deemed to be "dead," that is to say too far behind, but it is able to climb back inside the limits of "insurmountability," it doesn't matter. The losing team is still dead. I'd agree that it is highly unlikely that such a team would win, but I think James has been taken in by the gambler's fallacy. He writes "The theory of a safe lead is that to overcome it requires a series of events so improbable as to be essentially impossible. If the "dead" team pulls back over the safety line, that just means that they got some part of the impossible sequence—not that they have a meaningful chance to run the whole thing." The only thing that matters is the current situation. It's like saying, "There's no way they'll hit another 3-pointer. They just hit five in a row. They're due to miss." What does this have to do with football? It would be interesting to look at something similar in the NFL. When is a lead so safe that a team should stop throwing? Or when is it so safe a team should only throw on 3rd down? And so on. Basically, when should a winning team stop trying to gain a bigger lead and start trying to simply prevent big mistakes? When picking winners in an office pool, I'd guess that most people start with the point spreads, or at least look at the records of each opponent, when making their predictions. Most people have some sort of baseline even if it's not Sagarin, DVOA, or the regression-based predictions on this site. So I thought it would be interesting to look at the spreads, and how often they're correct in identifying winners. If someone needs to correctly pick a few upsets to win a pool, it might be good to know that some weeks are less predictable than others. You'd ideally want to pick upsets in weeks where the spread is less accurate. In this installment I'll look at how well the spread does in picking winners by week. My theory was that the spread would be relatively less accurate in the early weeks of the the season when there is less information about team performance. 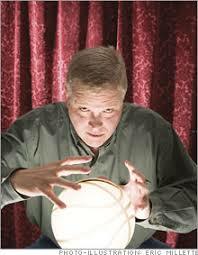 There may also be a high degree of bias towards teams expected to be strong in the pre-season. Week 17 may be inaccurate too, due to the uncertainty of some playoff-bound teams resting their better players. Additionally, late season weather may also contribute to higher uncertainty and less predictability. Using point spread data from the 2002-2007 seasons obtained here, I analyzed how often the spread was correct. Overall, the point spread favorites win 66.2% of the time. Weekly accuracy ranges from 59.0% in weeks 4 and 9 to 72.6% in week 12. 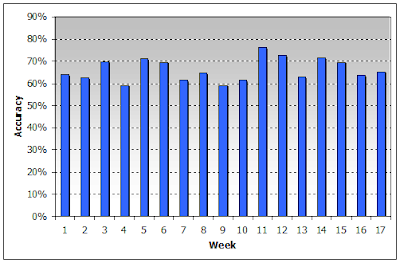 The graph and table below list the weekly averages. Although there appears to be substantial differences between some weeks, they are most likely random. The only statistically significant difference between any one week and the season average of 66.2% was week 12 with p=0.04. However, there are 17 weeks, so we should not be surprised to see a week or even two appear significant when there really is no systematic connection (a type I error). The bottom line here is that no week can be viewed as particularly favorable for picking upsets. If you're behind in your office pool toward the end of the season and need to pick some upsets to make up ground, one week is as good as any other to start getting aggressive. Next, I'll look at point spreads from a different angle and see how accurate they are at picking winners by the size of the spread. 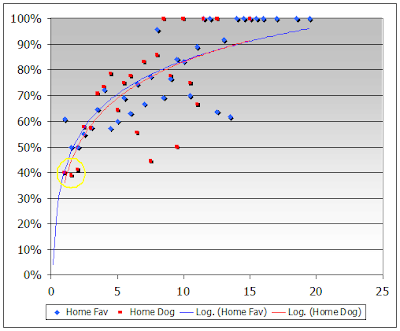 I'll also break it down into two types of games, home-underdogs and home-favorites, to see if there are any inefficiencies in how the spread accounts for home field advantage. Say I'm in an office pool pick 'em contest. My 10 buddies and I pick NFL winners each week, and the guy with the best record at the end of the season wins. My office mates aren't particularly good at handicapping football games, so I figure that if I pick the consensus favorite in every game (the team favored by the spread), I'll have a great chance to come out on top over the long haul. My office buddies have access to point spreads too. They tend to look at the spread (or at least look at each team's respective record, which is just as accurate) and then pick a couple upsets each week. 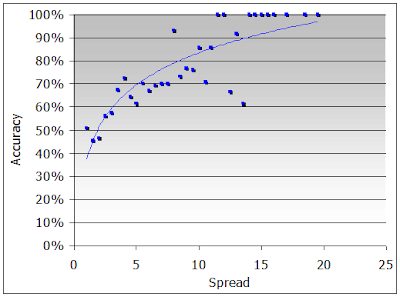 Over the past five years, the spread identifies winners correctly 66.2% of the time. So, normally, their upsets would be correct on average 33.8% of the time (100%-66.2%), but they won't be picking upsets in lopsided match-ups. (Although we can't always assume rationality, we will assume sanity.) So in their 34 chosen upsets (2 per week), my buddies will be right 45% of the time on average. I would have a 10% accuracy advantage in those games. After doing the math, each of my buddies would average a 63.3% accuracy rate (66.2% * 232 games + 45% * 34 games). And I'd average 66.2% accuracy. Man, I can't wait to collect my winnings! But wait. Because of luck, some would be slightly more accurate, and some would be less accurate. In fact, the only thing that really matters is how well each of them do on the 34 games they deviate from picking the published favorite. In the other 232 games, we'd have identical picks. Of the 34 games in question, each game that one of my buddies gets right, I must have been been wrong. One of my 10 friends needs to be correct greater than 50% of the time in his 34 games to beat me. The mathematical bottom line is, "How often is someone correct at least in 18 out of 34 trials with a 0.45 probability of being correct in any given trial?" The binomial distribution gives us the answer--it's 22.4% of the time. That's pretty good, right? I have a 77.6% chance of beating any one of my opponents. The only problem is that there are 10 of them. In other words, my chances of winning the office pool are just 7.9%--significantly less than a fair chance of 1 in 11. That's why just picking the favorites is a bad strategy. I'd actually be better off choosing the less accurate strategy of my buddies. At least then I'd have fair chance at 1 in 11. I realize that it is counter-intuitive that a strategy that is less accurate overall is better than a more accurate strategy. But in a contest against several opponents, the more risky strategy--with a greater deviation of outcomes--may be best. Note: Phil Birmbaum points out that the odds of the opponents are not independent of one another, and therefore the simple compound probability I calculated here is far too low. If one opponent happens to beat you, then the other opponents may be more likely to beat you as well, and vice versa. In the end, picking all favorites may be the better play. See his comments for an explanation.